Jobcentre staff are told not to keep a record of the number of people they direct to foodbanks, despite appearing to send thousands of people to charities providing food parcels to hard-pressed families. The instructions state that instead of offering referrals or vouchers to claimants, Jobcentre staff must only offer “signposting slips”. The only time Jobcentre staff are allowed to keep track is if the foodbank makes a request, the instructions reveal. “This record should only be used to authenticate the issue of signposting slips at the request of the foodbank,” the directive reads. Many foodbanks only serve clients who have been issued a voucher from an associated partner – usually a charity, or a branch of Citizens’ Advice. Two foodbank chief executives told the HuffPost UK that they’ve started to treat signpost slips as if they were vouchers, and they know other foodbanks do the same. Michael Beckett, CEO of Colchester Foodbank, said a signposting slip is essentially a foodbank voucher issued by a Jobcentre rather than another agent. “If it quacks like a duck and looks like a duck, I’m pretty sure you could say it’s a duck,” Beckett said. He said 16% of its clients were directed to them by Jobcentres, which he described as “our top partner referral agent”. Hammersmith and Fulham said 8.5% of its referrals were from Jobcentres. The Trussell Trust, the largest foodbank provider in the country, keeps data on all the people it helps. The charity told HuffPost UK that nearly 60,000 food parcels – around 5% of its output – were given out in 2016 as a direct result of Jobcentre signposting. By not officially keeping track of the data, the Government has been able to avoid answering awkward questions from MPs. Last month, Baroness Buscombe, the DWP’s spokesperson in the House of Lords, was asked how many families affected by a Government crackdown on benefits for households with two children or more were using foodbanks. “We do not record the number of people using foodbanks or other types of food aid,” she said, adding charities do keep records. The DWP Secretary, Esther McVey, previously refused to reveal the ‘Operational Instructions’ when she was a junior minister in 2013. 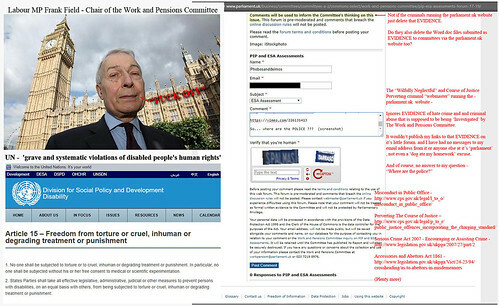 Labour MP Frank Field, chair of the Work and Pensions Select Committee of MPs, who campaigns against hunger in the UK, told the HuffPost UK: “Does the DWP not want to know how many times Jobcentre staff are having to refer people to foodbanks? The revelations come as a leak to The Guardian showed the DWP is about to conduct a study on the impact of its policies on the increased use of foodbanks, which are about to enter one of their busiest periods of the year. Access to adequate food becomes a problem for many of the poorest people in Britain, particularly during the summer holidays, as children are unable to benefit from free school meals. Some foodbanks, such as Hammersmith and Fulham, are running summer clubs in order to feed children that are missing out from free school meals. A government spokesperson said a £2m fund has been set up to help feed hungry youngsters. “We are committed to supporting families to improve their lives, and employment remains the best route to achieve that,” he added. What an Evil little hypocrite. Yeah. Turning two blind eyes. That directive dates back some years. JCP does not ‘refer’ people to Foodbanks and can only signpost them. The reason being that the decision to give food rests with the Foodbanks, which are not administered by DWP. Were JCP to refer people to Foodbanks it would carry an expectation that they would be given food. JCP issues a piece of paper containing the address of the Foodbank, its location, the name of the person being signposted and the office stamp. The use of the office stamp authenticates that the member of public (who do not need to be claiming benefits) has been signposted by JCP. There is no requirement to maintain statistics any more than say signposting a member of the public to the local CAB or the Local Council as there is no professional partnership between DWP and the services they offer. The main purpose of JCP is to help benefit claimants find sustainable work. The benefits themselves are administered remotely at benefits centres. JCP staff will always assist vulnerable claimants to contact the benefit centres if there are problems with their benefits. Foodbank administrators will contact JCP if a particular person/family is frequently using their provision, whether signposted by JCP or referred by another organisation as it may indicate a deeper problem such as budgeting, substance abuse, domestic abuse, modern slavery, gang involvement. JCP has trained experts in helping with this in (nearly) all Jobcentres. It is good that DWP is to undertake a review and will be even better if Ministers take heed and the Government takes action. Try taking RESPONSIBILITY for YOUR OWN actions Sicko. It’s avatar is a Vulture – appropriate. It’s to Abuse, Defraud, Torture and Murder. What planet is that on? So it’s all ‘Somebody elses fault’. What about Fraud from HATE CRIMINAL DWP FILTH and the QUACKS they employ?? ?